We've been clamoring for a date with the production version of the Toyota FT-86 for longer than we care to remember, but we officially have a new infatuation. Meet the boxer coupe's younger sister - the TES T-Sport Concept. If our Google Translator is to be believed, the car supposedly originated from an inner-company survey that asked what type of cars Toyota engineers would most like to see built. Apparently the overwhelming answer was a fun-to-drive, affordable sports car. From there, the Toyota Engineering Society set about crafting their vision of a low buck machine that could still slather a smile on your face. Power comes courtesy of a 1.3-liter four-cylinder engine with around 110 horsepower, and this thing hits the scales at less than 2,000 pounds. That sounds like a winning combination to us. The T-Sport Concept wears some plenty funky styling, but we certainly wouldn't hold that against a would-be Mazda MX-5 competitor. As with most things awesome that hail from auto shows, there's little likelihood that the T-Sport will ever see production. Head over to AutoGuide to get a closer look at the two-seater. [sources: Caradisaic, AutoGuide | Image: AutoGuide]TAS 2011: Toyota concept is the FT-86's little sister originally appeared on Autoblog on Tue, 18 Jan 2011 12:58:00 EST. Please see our terms for use of feeds. Kinda looks cool, not too big on the front but the rest of it looks pretty cool. 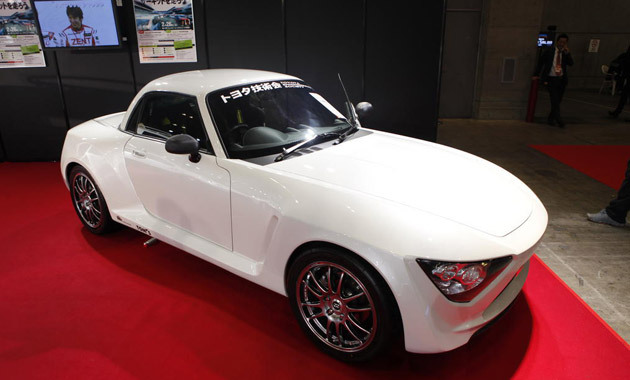 Looks like the Toyota version of the S2000 or Miata. Looks like fun! Reminds me of an old mg or Triumph (except that this will run with some reliability...)! Here's to small cars with pep!! !